My students are trying to piece together general theory of networks, inspired by many examples. A good general theory should clarify and unify these examples. What some people call network theory, I’d just call ‘applied graph invariant theory’: they come up with a way to calculate numbers from graphs, they calculate these numbers for graphs that show up in nature, and then they try to draw conclusions about this. That’s fine as far as it goes, but there’s a lot more to network theory! There are many kinds of networks. You can usually create big networks of a given kind by sticking together smaller networks of this kind. The networks usually do something, and the behavior of the whole is usually determined by the behavior of the parts and how the parts are stuck together. 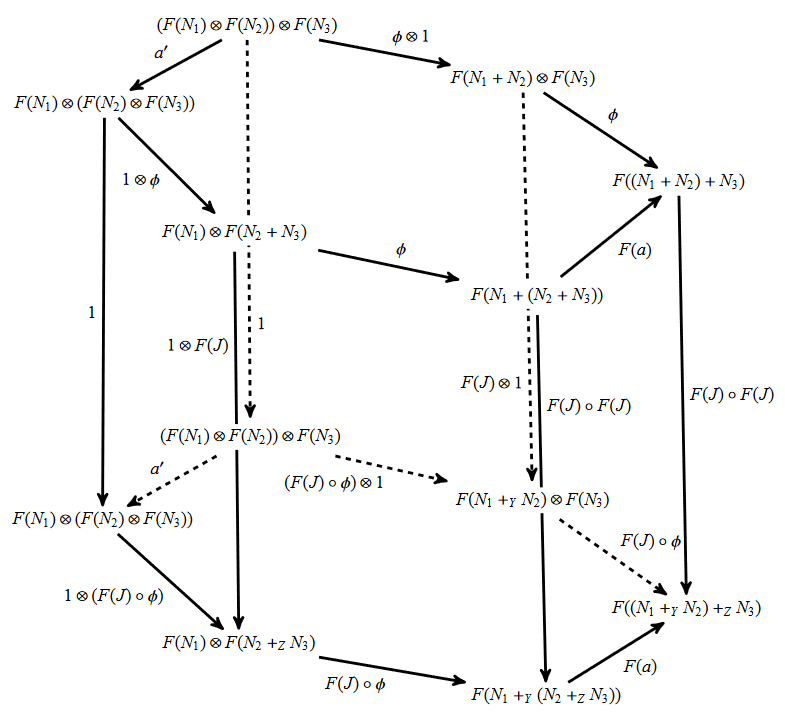 So, we should think of networks of a given kind as morphisms in a category, or more generally elements of an algebra of some operad, and define a map sending each such network to its behavior. Then we can study this map mathematically! Kenny Courser is starting to look at the next thing: how one network can turn into another. For example, a network might change over time, or we might want to simplify a complicated network somehow. If a network is morphism, a process where one network turns into another could be a ‘2-morphism’: that is, a morphism between morphisms. Just as categories have objects and morphisms, bicategories have objects, morphisms and 2-morphisms. • Kenny Courser, Decorated cospan bicategories, Theory and Applications of Categories 32 (2017), 985–1027. • Mike Shulman, Constructing symmetric monoidal bicategories. I would love to talk about the details, but they’re a bit technical so I think I’d better talk about something more basic. Namely: what’s a decorated cospan category and what’s a decorated cospan bicategory? Here the set consists of 3 points—but it’s decorated with a graph whose edges are labelled by numbers! You could use this to describe an electrical circuit made of resistors. The set would then be the set of ‘input terminals’, and the set of ‘output terminals’. In this example, and indeed in many others, there’s no serious difference between inputs and outputs. We could reflect the picture, switching the roles of and and the inputs would become outputs and vice versa. One reason for distinguishing them is that we can then attach the outputs of one circuit to the inputs of another and build a larger circuit. If we think of our circuit as a morphism from the input set to the output set this process of attaching circuits to form larger ones can be seen as composing morphisms in a category. In other words, if we get the math set up right, we can compose a decorated cospan from to and a decorated cospan from to and get a decorated cospan from to So with luck, we get a category with objects of as objects, and decorated cospans between these guys as morphisms! What did I mean by saying ‘with luck’? Well, there’s not really any luck involved, but we need some assumptions for all this to work. Before we even get to the decorations, we need to be able to compose cospans. We can do this whenever our cospans live in a category with pushouts. 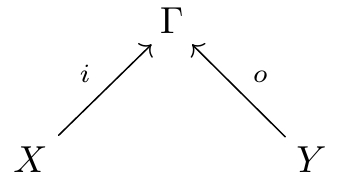 In category theory, a pushout is how we glue two things together. 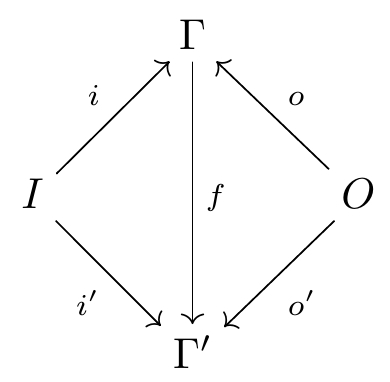 All this is fine and dandy, but there’s a slight catch: the pushout is only defined up to isomorphism, so we can’t expect this process of composing cospans to be associative: it will only be associative up to isomorphism. What does that mean? What’s an isomorphism of cospans? where the two triangles commmute. You can see two cospans in this picture; the morphism provides the map from one to the other. If is an isomorphism, then this is an isomorphism of cospans. To get around this problem, we can work with a category where the morphisms aren’t cospans, but isomorphism classes of cospans. That’s what Brendan did, and it’s fine for many purposes. • maps of spans in as 2-morphisms. So, if you’re interested in decorated cospan categories, and you’re willing to work with bicategories, you should consider thinking about decorated cospan bicategories. And now, thanks to Kenny Courser’s work, you can! For the explanation, check out Proposition 4.1 in his paper. I’ll talk more about applications of cospan bicategories when I blog about some other papers Kenny Courser and Daniel Cicala are writing. This entry was posted on Saturday, July 8th, 2017 at 12:07 am and is filed under mathematics, networks. You can follow any responses to this entry through the RSS 2.0 feed. You can leave a response, or trackback from your own site.